Did you know that cork is not just for corkboards anymore? Cork flooring is great environmentally friendly flooring that feels great under your feet and looks great too. Cork flooring in a kitchen will instantly update your kitchen and best of all make it feel warm and inviting. It has quickly become one of the most preferred flooring options due to this unique feel and classy look. Cork flooring has many other benefits also. Related: Check out our article on the best types of kitchen flooring! Why would you put cork flooring in the kitchen? If you are concerned about the environment, cork flooring is an excellent choice for you. Cork is a renewable resource, which means that the trees are not cut down to make the cork, as it comes from the bark of the tree and the bark regrows within nine years. 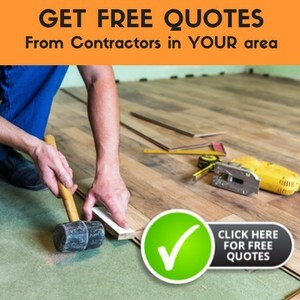 This is a great benefit over hardwood flooring since the trees are cut down to be used for flooring, and it typically takes 30 years–sometimes much longer–for a tree to be large enough to be used for flooring again. Hence, this has quickly become one of the favorite flooring options for people who care about the environment. Cork flooring is also wonderful for homes with family members with allergies. It is hypoallergenic and does not absorb dust or mites, letting you mop the floor clean to remove the allergens. This makes it an ideal flooring for people with allergies, as the dust will not cause them problems. Is cork flooring in a kitchen a good idea? Yes! Cork flooring is resilient, which means that it has some cushion when you walk and stand on it. This is great for the kitchen where you stand for long periods of time preparing and cooking food. Cork flooring is also very durable, which is a big benefit in the kitchen as it is probably the most traveled room in the entire house. Being water resistant and easy to clean are also great benefits in the kitchen where spills and messes are very common. It also has the added benefits of being an insulator, which is great for noise and temperature control. The above properties make it a premium choice for kitchen flooring. The beauty of cork flooring is unparalleled. Cork comes in many different colors from different shades of tan to red to black so you can mix and match colors to create a custom floor all your own. And because of its patterning with light and dark swirls, it hides dirt and blemishes well. Of course that can be a bit of a problem if you drop something you want to retrieve or clean; but you’ll get over that in no time. It is neutral enough to go with any design style, yet makes a statement of beauty and warmth that other floorings cannot even come close to matching. Due to its wide variety, people never run out of options because there is always something for everyone. No matter what your choices are, you always stand a very good chance of finding something that fits the bill perfectly. Cork flooring comes in two basic styles; tiles and floating planks. Cork tiles are glued directly to the subfloor while floating cork flooring is clicked together and sit on top of the subfloor. Some cork comes prefinished with a UV-cured finish; be careful with this because it may not be as durable as a polyurethane (water-based being environmentally the best choice). One of cork’s unsung benefits is that it is “self healing”. It’s more resilient to compression from furniture than carpeting or vinyl and linoleum. When you drop a knife or other sharp object on it, the wound heals up so you don’t see it. Sounds fascinating, right? What other flooring can promise you all this? It’s an incredible flooring material! Care for your kitchen cork flooring is simple and easy. Cork flooring just needs regular sweeping and damp mopping to get rid of dirt and debris. Once a year or when your floors start looking dull, you can refinish the cork flooring, according to your manufacturer’s directions. If you are looking for an environmentally friendly way to cover your floors, you want to consider cork flooring for your kitchen. Kitchen floors are very important as the kitchen is a very important room in your home. Cork flooring will help your room feel warm and inviting for you, you’re family and your friends so that you will all want to gather and enjoy your kitchen even more. We put cork floating flooring in our kitchen and living room. It was prefinished and the installation instructions didn’t say anything about sealing it. All I can say is that it was a big mistake! Between the moisture in the air in our humid climate, and our geriatric dog having accidents that we didn’t notice until too late, it’s been a disaster. The seams are swelling an buckling up and it looks awful. It’s only been a couple of years, and will need to be replaced. Hello Flooring Lady, I love your site. I desire to have a cork floor installed in my kitchen and one bedroom. I just had tile removed and their was layers of linoleum underneath. There are still chunks of linoleum left on the subfloor. I’ve heard of a this plywood that could be laid for a smoother surface. What is it called? Also I live in Atlanta, GA. I have called 5 installers that claim to install cork and none of them have ever installed cork tiles, the glue down type. They all say it is the same as gluing down vinyl or any other material. but i know from reading on your site that cork is a natural material that has different properties. Where can I find a professional that has laid glue down cork tiles? I really want someone that has experience in this specifically. Also I was going to use Lisbon cork, sunset, tiles. They are 1 sq ft and only 4mm thick. very very thin. One side is finished. Someone recommended that I go to Georgia Oak and they have tiles that are 2 feet by 3 feet, unfinished, but almost twice as thick. ONly it is usually used as an undelay for hardwoods. Would I be able to use this and finish it ? Thanks a million. I have been struggling with this for months. I must get my kitchen floor in to get a kitchen and finally move in my first place. thanks again. Hello Semone, Thanks for the compliment. I’m glad you found me. that’s ok, given doors, cabinets and appliances then go for it. I don’t know what you are thinking of when you ask its name, though. you are putting a durable finish on it. I agree that a thicker cork will be more durable than thinner. because of its elastic qualities and durability, and because it’s a low VOC product. You want the low VOC because it keeps your air quality better. Then use the water-based Varathane Diamond Coat Urethane formulated for floors to seal it; follow their directions for the best results. Good luck! I hope you enjoy your cork floor. I have heard that cork flooring leaves permanent dents from bar stools, chairs and such. Is this true? Or will the flooring “bounce back in time”? Cork has memory and will bounce back depending on the manufacturer. I would consult a local professional to inquire as to the memory or hold the cork you are interested has. No. It is not a mistake. It should not hurt anything to add another coat of polyurethane to be sure the floor is well sealed and protected. I would check with the manufacturer on what the best products are for your flooring.